EVERCUT® is truly a technological gem that required 5 years of R&D. This unique technology produces an extremely sharp blade that lasts virtually forever, without requiring any sharpening at all. TB offers a lifetime warranty on all EVERCUT® products through an online serial number registration program. It is a true revolution in the modern process of manufacturing knives. We created a new material made from titanium carbide, one of the hardest materials on earth after diamond. Using a laser beam (at a 7000°F instant temperature), we fuse this ultrasolid material to stainless steel to create the cutting edge of the blade. This process allows us to combine the flexibility of stainless steel with the durability of titanium carbide, which results in an unbreakable, everlasting cutting edge. Certified Independent British CATRA laboratory's results show that EVERCUT® knives cut 300 times longer than conventional steel blades and up to 5 times longer than ceramic blades. In addition, EVERCUT® knives offer outstanding cutting performance and a sleek look at a very competitive price! EVERCUT® TECHNOLOGY - EVERCUT® is truly a technological gem that required 5 years of R&D. This unique technology produces an extremely sharp blade that lasts virtually forever, without requiring any sharpening at all. TB offers a lifetime warranty on all EVERCUT® products through an online serial number registration program. It is a true revolution in the modern process of manufacturing knives. We created a new material made from titanium carbide, one of the hardest materials on earth after diamond. Using a laser beam (at a 7000°F instant temperature), we fuse this ultrasolid material to stainless steel to create the cutting edge of the blade. This process allows us to combine the flexibility of stainless steel with the durability of titanium carbide, which results in an unbreakable, everlasting cutting edge. Certified Independent British CATRA laboratory's results show that EVERCUT® knives cut 300 times longer than conventional steel blades and up to 5 times longer than ceramic blades. In addition, EVERCUT® knives offer outstanding cutting performance and a sleek look at a very competitive price! PREMIUM KITCHEN KNIVES - Much appreciated by chefs and coming from the Made In France range, kitchen knives from the Absolu range are made of very high quality steel. Manufactured in France, these kitchen knives are equipped with an ergonomic handle made of Indian rosewood or polymer. In addition to be durable, the particularly impressive double bevelled blade enables a very precise sharpness. PROFESSIONAL KITCHEN KNIVES - The professional qualities of the Forgé kitchen knives place them among the most appreciated by cooks. Part of the Made In France collection, the Forgé kitchen knives are manufactured from a very high quality stainless steel in the workshops of the leader of French cutlery TB Groupe in the city of Thiers. With their elegant and ergonomic handles whether made of bakelised wood or polymer bearing stainless steel rivets, these French knives all have a massive forged bolster. They also have high quality blades that offer high precision while cutting. JAPANESE STYLE KITCHEN KNIVES - The Equilibre Premium range is a part of the Made In France collection. Leader in the knife making market, TB Groupe reinvents the famous knives from the land of the rising sun to offer Japanese knives such as Santoku, Deba and Yanagiba a French manufacturing. Equipped with a very resistant handle made of mikarta, the kitchen knives from the Equilibre Premium posess a high quality double bevelled thin blade, which offers a very thin but particularly formidable sharp edge. 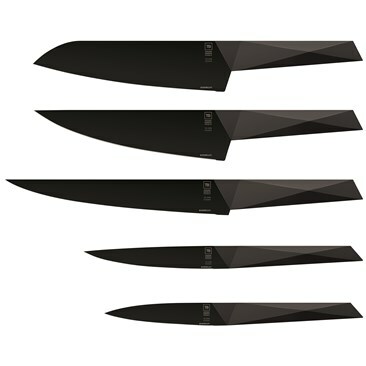 MODERN DESIGNS - Much appreciated by chefs, the Transition kitchen knives are part of the Made In France collection. Made of stainless steel, their ergonomic handles are the ideal extension of a high-end blade, also made of high quality tempered stainless steel. These blades can be personalised by laser engraving. Crafted in the French cutler TB Groupe workshops in the city of Thiers, cradle of French cutlery, Transition kitchen knives offer a precise and efficient cut. The cleaning is very easy as it can be placed in a dishwasher. KITCHEN KNIFE SETS - Made of superior raw materials, the kitchen knife sets from the Laguiole Evolution® range have been manufactured in the respect of an ancestral know-how passed down through generations in the family company of Tarrerias-Bonjean. The French knife maker modernised the emblematic lines of the famous Laguiole knife. With a very contemporary design, the Laguiole Evolution® kitchen knives are here proposed in a set and become the must-have equipment of every cook. With particularly ergonomic handles and stainless steel full tang blades, the kitchen knife sets from the Laguiole Evolution® range are high quality, elegant and efficient utensils. CERAMIC CUTLERY - Leader on the French knife making market, TB offers a very large range of ceramic utensils and knives. Whether it is black or white, the ceramic used by TB to produce its kitchen knives is always made of high quality. Due to its high zirconium oxide content, it is thus very resistant and has an everlasting cutting power that will rarely need sharpening. In addition to be efficient, resistant and very hygienic, every single ceramic knife signed Tarrerias-Bonjean prevents food from sticking to their white or black blades. Very light and ergonomic, the handles made of ABS black or white ceramic have a soft-touch finish, which makes their grips really comfortable. Laguiole Evolution® Collection - Because Laguiole knife’s aspect has continuously changed throughout the years, at TB, we are convinced that France's most trusted and revered steak knife is part of an evolution. So we decided to create Laguiole Evolution® to express our own vision of Laguiole cutlery. Through this TB owned and registered brand, we strive to offer modern and elegant designs while preserving the identity of this landmark of the French cutlery industry. The Laguiole Evolution® collection includes kitchen knives, utensils and flatware. All of our products are crafted from high quality raw materials, in the respect of a traditional process passed down through generations. Each one of our Laguiole Evolution® item proudly bears the signature Laguiole bee, a full tang and an ergonomic handle. KIDS FLATWARE SETTINGS - Concerned to adapt its products to every gourmet, Tarrerias-Bonjean increased its flatware range with children flatware sets. Made of high quality stainless steel, this flatware is bestowed with nice bi-injected and colourful handles to enable the children to savour at their own pace.